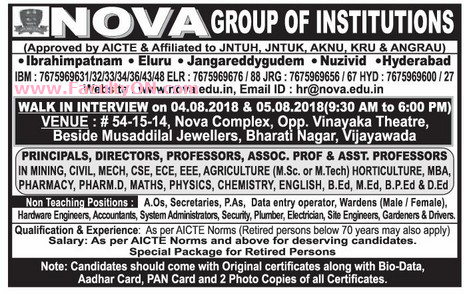 Nova Group of Institutions, Hyderabad has advertised in the EENADU newspaper for recruitment of Teaching Faculty - Principal, Directors, Professors, Associate Professor, Assistant Professor Plus Non-Faculty jobs vacancies. Interested and eligible job aspirants are requested to walk-in on 04th and 05th August 2018. Check out further more details below. About College: Towards realizing this Vision NOVA EDUCATIONAL SOCIETY embarked upon the Mission of establishing Institutes of Technology & Research, Colleges of Pharmacy, Colleges of Education & Colleges of Management at different campuses spread over various parts of Andhra Pradesh. They offer both UG and PG Programmes in a variety of courses. Among these some of them are exclusively for women. How to Apply: Interested and eligible candidates are requested to attend the Walk-in interview along with all originals & 02 copies of certificates / testimonials, PAN card, Aadhaar card and recent PP size photos to the walk-in address provided here.